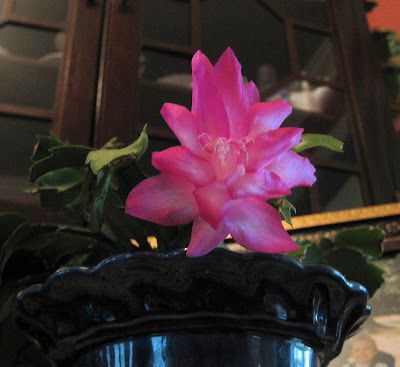 This stunning blossom is on a Christmas Cactus that was my mother's. that is, until 2007 - the year she died. I brought the plant home with me and it bloomed again in 2008. This week it began to bloom again and it makes me so happy to see it. Christmas Cactus are not easy bloomers. February to March - Resting (55 degrees, infrequent watering). April to May - Water thoroughly when potting mix begins to dry out. June to August - Place outdoors in a shady spot. September to October - Plant prepares to flower. Reduce length daylight hours. Keep on the dry side and cool (55 to 60 degrees F) until flower buds form. Then increase water and temperature. November to December - Flowering. Water normally. Temperature no less than 55 degrees F.
I'm having a pink giveaway so drop by! This is a lovely pink cactus! It is such a pretty shade of pink. I love the cactus. I have one I have pampered along hoping it will bloom..so far, nothing.But I have hope..:). Happy Pink Saturday and have a lovely day. Oh' so pretty. Phil has a Christmas Cactus. They are so lovely when in bloom. I love christmas cactus...especially the pink ones! And I am so sure the blooms are showing you Mom is with you...Happy Pink Saturday! I have one that is a cutting from my grandmothers! I have not had it bloom, but my mom's has! What beautiful blooms. I lost mine this year after having it for years. Thanks for sharing your's! That is a gorgeous flower. One day when I am more organized, I am going to have to get one of those. I have a crown of thorns that was my grandmothers, which I have had since she passed away, about 12 years ago, and I treasure it. I take cuttings and give new plants to other family members. So very lovely to see something in bloom (here in snow and ice). It is very beautiful. Happy pink Saturday to you. It bloomed like a little present from God in honor of your mom. I love it. What a great pick for Pink Saturday! You are so lucky to have one of these blooming in your home. I love Christmas cacti but its been years since I've grown one. Thank you for the growing guide, that might make it easier! thanks for the heads up on the care...I seem to kill all house plants..but have a green thumb when it comes to outside. You have your mom right next to you. She's blooming just for you dear Miss Bee. They do things just to keep you on your toes. Are you out of the closet yet? Can you come out and play soon? This friend misses you. Your mother must be smiling looking down on you and those blooms. They are beautiful. I love the blooming cactus, whether it be Christmas, Easter, or Thanksgiving! Thank you for the lovely photos, Deborah! That's a very special Christmas cactus. YOUR CHRISTMAS CACTUS IS VERY PRETTY. Stunning, Deborah! My mom had a red one and it was always so pretty! Deborah, that is a beautiful bloom. A pretty shade of pink too. 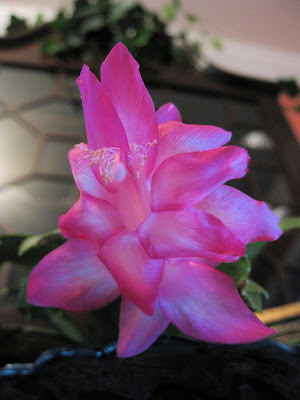 I had a Christmas Cactus that always bloomed in January when I lived in Fl. My Cactus bloomed in November here in NC. Thank you for the tips on how to care for them. I didn't know anything about caring for a Christmas cactus. Wow, it's late so I'll say goodnight. That is a lovely cactus flower. Thanks for the tips on how to care for...I actually have a friend that killed her cactus plant. Never thought such a thing was possible! LOL! Happy pink day and weekend. I love these plants! Do the directions really, really work? My poor plants always die, after blooming. Sigh. Happy Pink Day! Deborah, I need to let you know I doubt I will participate in Friday's foto day. I will be just coming home from the hospital. I want to but if you send me an e-mail I won't be able to answer. How nice for you to have a living memory from your mom. I had a Christmas cactus for 25 years! They are such pretty plants. Nice to meet you, my first Pink Saturday.